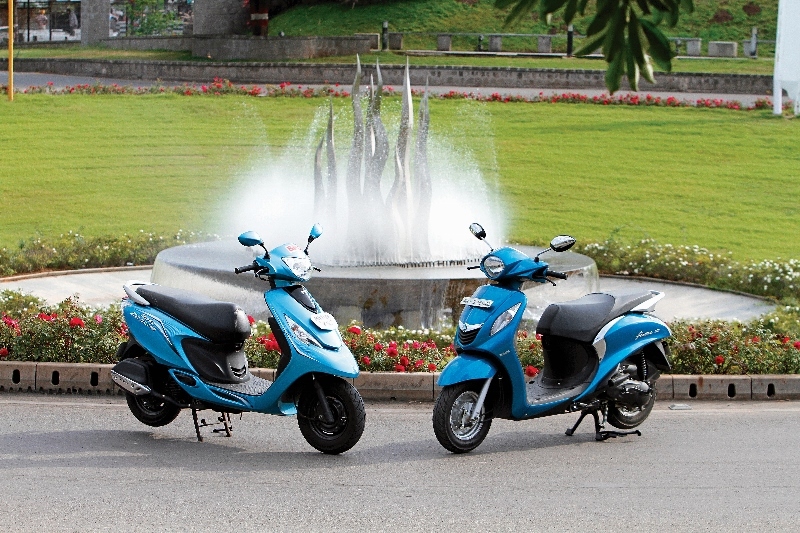 The Indian automatic scooter market is largely divided into two classes: 110 cc and 125 cc. Honda have the highest market share in the 110-cc class with a line-up of four distinctly packaged scooters, but they were absent from the 125-cc class until this year. 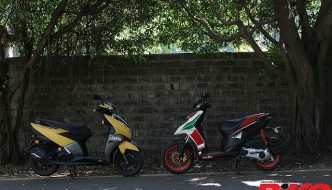 The sales figures in respect of 125-cc scooters have seen a steady growth over the past few years and they have captured a small but significant chunk of the market. Therefore, Honda could no longer delay their entry into the higher class since they did not want buyers to opt for a different brand, thus reducing their dominance in the field. In comes the Activa 125. 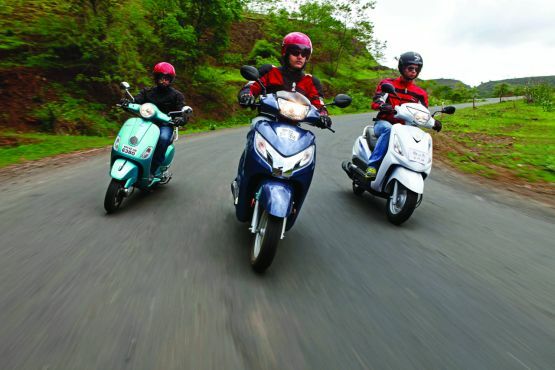 Unveiled at the Auto Expo 2014, the 125-cc version of the Activa is an all-new scooter that was launched at the end of April this year. 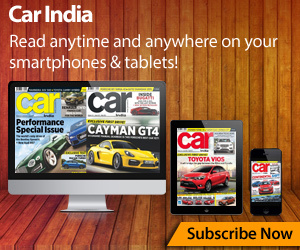 We had reviewed it in the June issue of the magazine and were impressed by Honda’s latest offering. 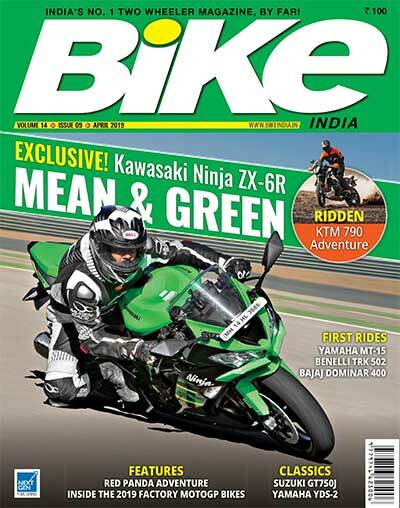 However, this new entrant faces stiff competition in the 125-cc class from the Suzuki Swish 125 and Vespa VX. So we decided to compare the three scooters to see where the Activa 125 stands vis-à-vis its competitors. The Honda Activa i is an Activa with a plastic body. What’s the point? 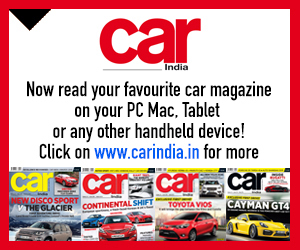 You may ask, since the Activa’s built-to-last feel comes from its metal body. 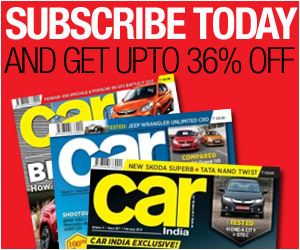 It does indeed, but it also contributes to the higher pricing of the Activa vis-a-vis its plastic-body alternatives in the 110-cc scooter segment. There are buyers who actually prefer the plastic body due to light weight and cheaper body panels. Of course, Honda have the 110-cc Dio and Aviator scooters with plastic bodies. 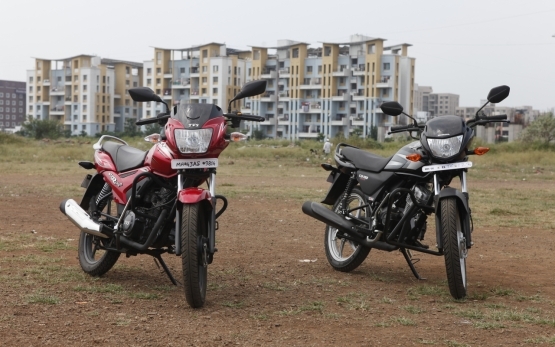 However, the Dio’s sporty design holds a lesser appeal for mature buyers looking for a utilitarian scooter, while the Aviator is a big scooter with muscular curves and costs more than the Activa. That’s where the Activa i comes in. 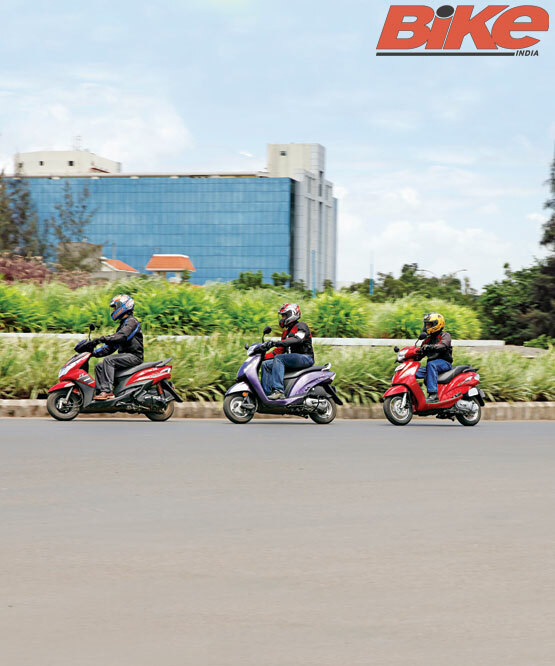 The Honda Activa i is leaner, lighter and faster than the Activa and also the least expensive scooter in Honda’s scooter line-up. 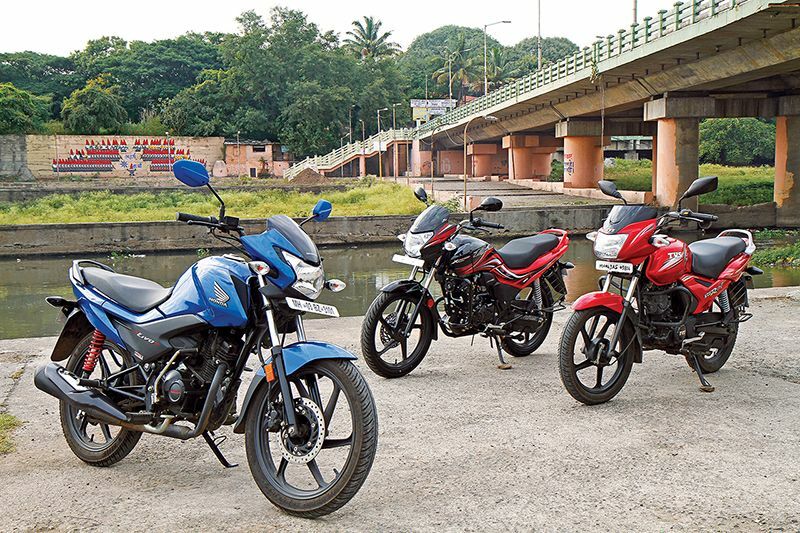 But the TVS Wego and the recently launched Yamaha Ray Z aren’t going to make its life easy. Therefore, we compared the three scooters to put things in perspective. The Activa i has a neutral styling with hints of the Aviator’s design and comes in four colours. 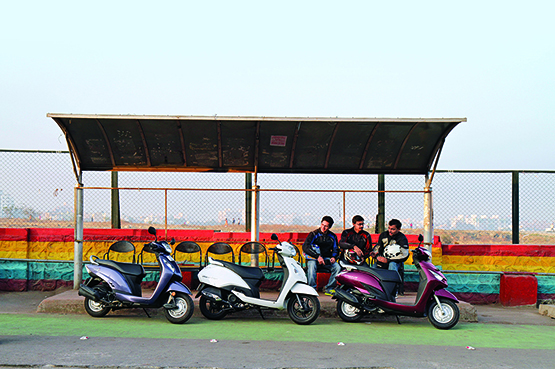 The Wego has a wider palette of six colours and its design is angular at the front, but gets meatier at the rear. It looks fresh in spite of being the oldest one here while the Ray Z looks sharp and sporty. The Ray Z, unlike its sibling (the Ray), is aimed at male riders and has three dual tone colour schemes and sporty decals with carbon finish on a few surfaces. There is a small plastic screen over its head and it has an all-black theme for the wheels, engine and exhaust. It looks more aggressive than the other two scooters and also has a slightly better finish overall. 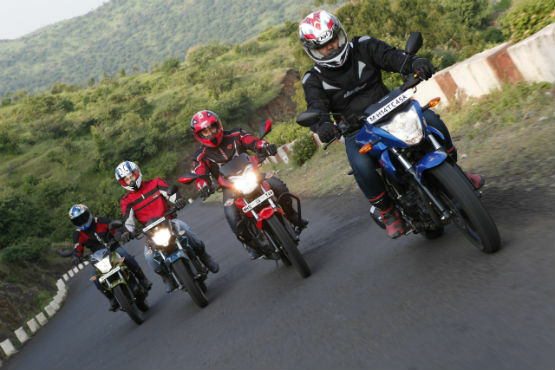 In terms of features, the Wego is the strongest. It has a robust all-metal body, telescopic front forks, five twin-spoke alloy wheels, a 220-mm optional disc brake on the front wheel and LEDs in the tail-light cluster. 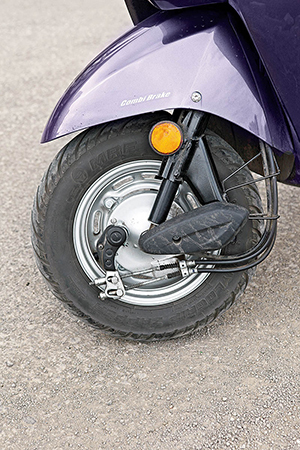 Furthermore, TVS have smartly placed the fuel filler cap on its tail, so the rider can fill the scooter up without having to dismount. 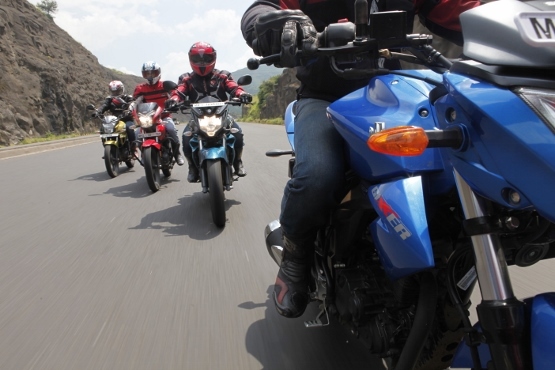 It has the broadest seat with a very soft cushioning and a foldable side-step for the pillion rider on its left side. 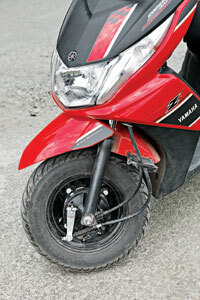 We also found that the Wego can be kick-started without putting it on the centre-stand unlike the other two. 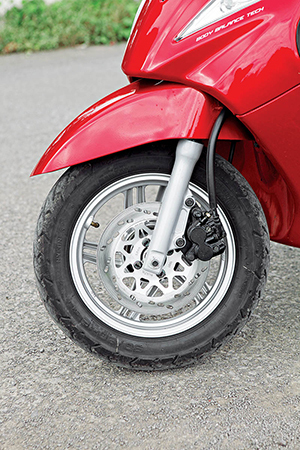 The Wego is followed by the Activa i, which has combi-brakes (front and rear brake are applied simultaneously via the rear brake lever) and tubeless tyres. It also has the best under-seat storage capacity and a brake locking mechanism for the rear brake lever. 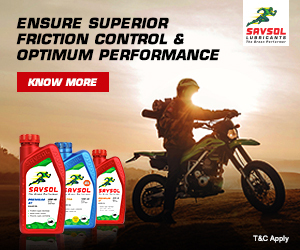 The Ray Z’s feature list includes telescopic front forks, carburettor with throttle position sensor for better air-fuel mixture, best looking information panel and a couple of pockets below the handlebar to store small items.